Description: Apologue; late 16th century. These quatrains are taken from the poem beginning Cia is sine cairt ar chrích Néill? ‘Whose is the oldest charter to the land of Niall?’ by Clare poet Domhnall (mac Dáire) Mac Bruaideadha. It is a stirring poem of incitement to James ﬁtz Maurice Fitzgerald (Séamas (mac Muiris mheic Sheaáin) Mac Gearailt), who died in 1579. It was likely composed at the beginning of the first Desmond rebellion (1569–73). At this time, fitz Maurice had become leader of the Geraldines in Munster following the detention of the earl of Desmond and his brother in the Tower of London. The poem amounts to a charter for fitz Maurice to wage war with the English. Its message is conveyed with reference to both native history and prophecy. The quatrains excerpted here are from a lengthy apologue that forms a section of the poem (for apologues in bardic poetry, see general guide to Cú Chulainn an chroidhe mhir). The apologue in Cia is sine cairt ar chrích Néill? comprises a prophecy revealed in the form of a dialogue between St. Fionnchú, who died c. 664, and a prophet named Séadna. The prophecy is unambiguous: Séadna foretells the coming of a Greek whose descendants will rule Munster and protect Ireland. This ‘Greek’ may be understood as referring to the Anglo-Norman progenitor of the Munster Fitzgeralds (the Fitzgeralds are conventionally referred to as Greek in bardic poetry). In time, Ireland will be treacherously taken over by English forces who will leave the country in misery and suppress its religion. In response, a hero will rise up in the south to lead the ‘Greeks’ and an alliance of both Old-English and Gaelic Irish to victory over the English in a decisive battle. This is the point at which our excerpt (qq. 31–33 of the poem) occurs, bringing the apologue to a close. Following this, ﬁtz Maurice is addressed directly, equated with the hero of the prophecy, and urged to take up arms against the English. Copies of the poem appear in 19 different manuscripts. The earliest, written c. 1577, is defective. 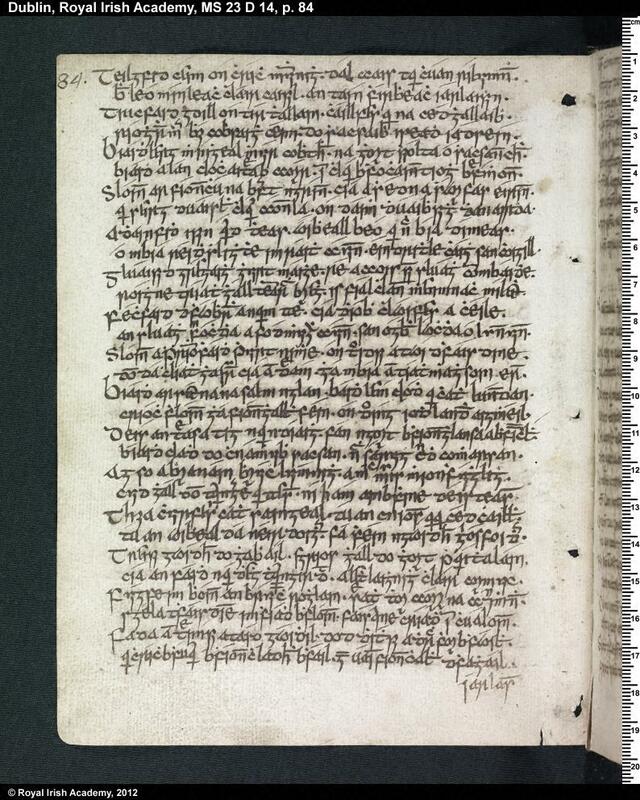 The seventeenth-century copy linked here (RIA MS 23 D 14 - image courtesy of Irish Script on Screen) is derived from the earliest copy. that will possess that land-plain of Ireland? from the fierce zealous throng. that the cattle of neighbours do not [i.e. will not be able to] breach. Below are some tips to understanding and navigating particular sections of the poem that may challenge learners. Some of these were generated with the input from participants in workshops at the 2018 Tudor-Stuart Ireland Conference (held at Queen's University, Belfast) and at the Oxford Celtic Seminar. Our thanks to the organizers of both sessions for the opportunity to present; special thanks to John Cunningham and David Heffernan for the former, and Archie Cornish and Mark Williams for the latter. While de and do are separate and independent words – see paradigms for each in the Grammar – the preposition de has largely fallen together with do in form (excepting prepositional pronouns). Examples of this convergence are readily found, and to be seen in other Texts on this site. The numeral dá takes the ‘dual’ case, which is no longer a feature of Modern Irish. This should not cause much confusion, but it is worth being aware of. In form, the dual case appears as either nominative or accusative singular, or as genitive plural when genitive. Here we have an example of a compound built of two nouns. This is an extremely common feature of Early Modern Irish, and can cause some problems attempting to look up words in dictionaries/glossaries. When encountering a long, complicated word like this, consider that it might be a compound and look for the initial word, while bearing in mind that the second word is going to be lenited (unless the initial letter is a vowel or a consonant that does not take lenition, such as l, n or r). The unexpressed but implied copula is a very common feature of bardic poetry. Further examples can be found in other texts on this site, for example the first line of Brian Ó Ruairc mo rogha leannán. In workshopping this text at the Tudor-Stuart Conference, a number of attendees wondered if this might be an eclipsed version of bia, the Modern Irish word for ‘food’. As such, it serves as an excellent example of the false cognate (or ‘false friend’) element of moving from Modern to Early Modern Irish. There are numerous Early Modern Irish words that seem to match Modern words. Sometimes this is the case, but often it is not. Especially when reading bardic poetry it repays to look up words and not assume their definition. The latter can lead to some wild translations, and subsequent frustration. One of the trickiest elements of bardic poetry is the fact that semantic units can be separated by intervening text and spaced across lines of the quatrain. For instance, the subject of this verb does not appear until the third line of the quatrain (i.e. críoch). This example is fairly straightforward in that subject and verb are part of a quotation and thus divided by reference to the speaker and an interjection helpfully set apart by dashes. Identifying semantically contiguous units is not always so easy, however, and one must be prepared to read across lines and within them to follow the meaning of the quatrain. The rules for initial mutation are more complex in Early Modern than in Modern Irish and here is one example: this adjective is eclipsed as it follows a genitive plural noun. Here again is an example of an implied copula, which we note again here merely to reinforce how common a feature this is of the poetry. One might reasonably wonder why ar is not causing lenition in the following noun cath. This preposition, however, is not always predictable on this point: sometimes it is taken to lenite, other times not. Let the particular edition/manuscript be your guide on this point, bearing in mind the variance. Here is an example of a variation on the false cognate problem: not mistaking the word, but rather taking a different definition. In workshopping this poem, a number of readers suggested that this was a form of the verb críochnaigh ‘complete/finish’ rather than the noun críoch, which carries the secondary meaning of ‘land, territory’. So, again, it’s never a bad move to double check assumptions against the Glossary (or DIL, or Dinneen). A rich and evocative element of bardic verse is the many, many poetic names for Ireland it contains, often connected to the names of great lords of yore, noble progenitors and the like. See Eleanor Knott’s discussion of this point, with numerous examples: Poems of Tadhg Dall Ó hUiginn, vol I., p. lvii. As noted above, the rules of initial mutation are more complicated in Early Modern Irish, here eclipsis follows an accusative singular noun.